Finally, after way, way, way too long, I replaced the shocks on my car. I would have done it sooner if I had known just how busted my old ones were and how much better the new ones already seem. It’s hard for me to break the mindset that if something isn’t objectively preventing my car from running, it doesn’t really need to be fixed. And it’s not like that hasn’t kept me busy anyway. 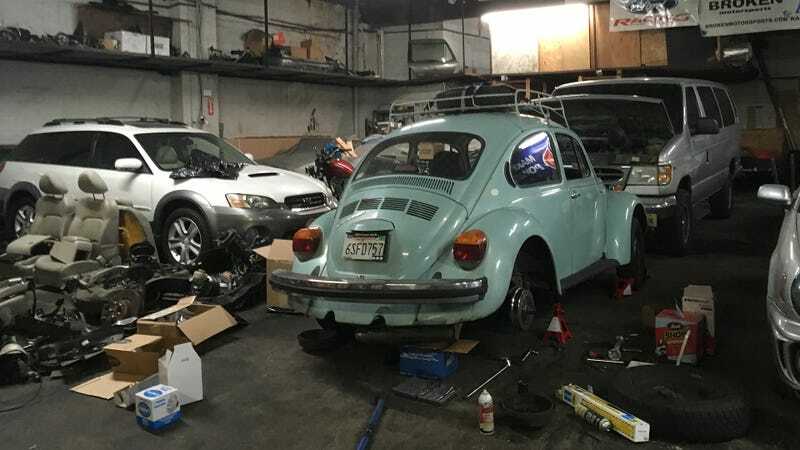 My ‘74 VW Beetle needed its engine out within a day of me buying it, and things went downhill from there, culminating in a busted engine on the side of I-40 in Arkansas. Other problems like the car refusing to start, the brakes nearly failing, the carbs not idling, the carburetor linkage being out of whack have been more pressing issues. I always wanted to change out the shocks, they just weren’t a priority. This past weekend, I knew I absolutely had to fix my brakes, so I at least had the opportunity to swap my shocks while I was at it. I asked my buddy and rally driver Bill Petrow if I could wrench at his shop, and not long later I was driving over his place Broken Motorsports on the far side of the Lincoln Tunnel in Union City, New Jersey. I took a break from ogling his lovely new Peugeot 505 wagon and the weirdo old rally and drift cars he has in the shop and got to work. Now, I actually kind of liked how my car rode on its old shocks. I’ve mostly only driven it on the highway, and on the highway the thing rode softer and comfier than any other car I’d been in. No new Cadillac rides as comfy as my VW did. Saying it was like a couch would give you the impression of something too firm. But anytime I turned the wheel, the car wallowed over like it was in a 1970s police chase. It wasn’t great. To be fair, these shocks still had ‘Made In Western Germany’ on them, so they’re at least 28-years-old. Judging by how much else on this car looks like it’s never been replaced, I’d imagine these shocks are as old as the car itself. I was honestly a little worried that my car would ride terribly with the new Bilsteins. (They’re Class 9/Class 11 Baja racing shocks, 7100s, about $150 per corner.) But the ride is good still, only now the car doesn’t heave and wallow all over the place. It’s nice. More to the point, I’m stunned at how much better the new units are than the last, and I only wish I’d done the swap earlier. I’m probably going to say the same when I rewire the car, but I’m not exactly rushing to go through with that plan.